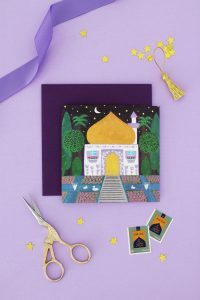 Ramadan Ideas: Plush Crescent Star Garland – Hello Holy Days! 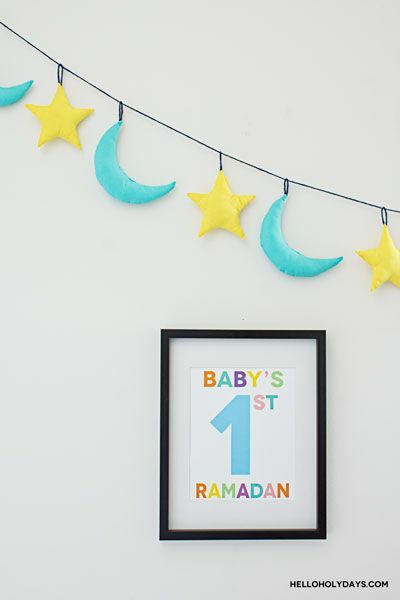 Looking for Ramadan ideas for baby’s 1st Ramadan? Make a plush garland with the emblem of Islam to hang in your nursery room. 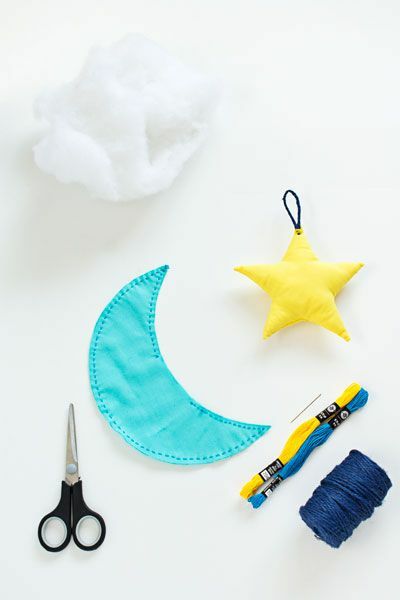 Easy to make, this crescent star garland will last you through the years. Store away after every Ramadan, and as baby gets older, every holiday he or she can take out this precious keepsake to put up in their room. Download and print clipart. Cut out clipart. Fold fabric in half and trace clipart onto fabric with pencil. Make 4 crescents and 4 stars, or more if desired. Cut fabric and hand stitch shapes using needle and embroidery floss. * Leave 2″ of space unsewn on each crescent and star. Turn shapes inside out. Use a needle to help fully turn out the small points. Fill each shape with batting through the 2″ space left open. Cut a 4″ piece of twine and fold it to create a loop. Stitch the ends of the loops onto the plush shape as shown in the picture. Repeat for each crescent and star. Trim a piece of 2 yard twine. Hang the plush shapes off the twine and secure garland to wall. *Embroidery floss is made up of 6 threads. One thread of floss, double threaded, is used through out this project.